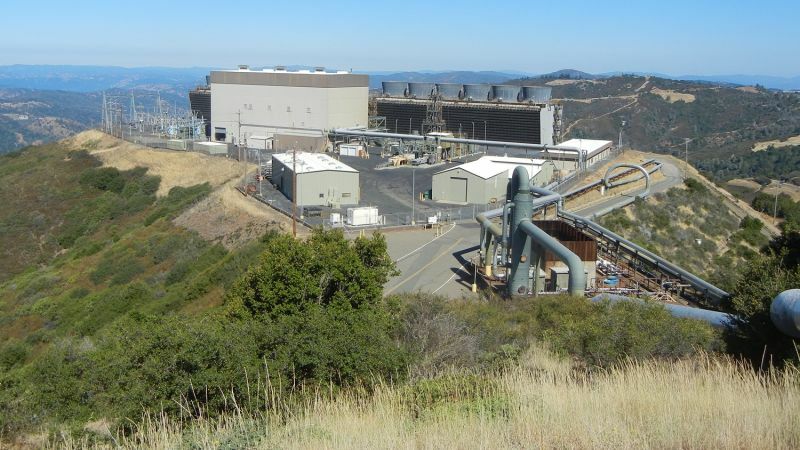 The Geysers geothermal field, in the Coast Range near Clear Lake, has been supplying California with clean electricity for 55 years. Over time, the output of this field has slowly declined, raising questions about how long we could rely on it. But a recent experiment offers confidence that we can keep drawing power from The Geysers for many decades to come, by tapping its superheated deeper layers. 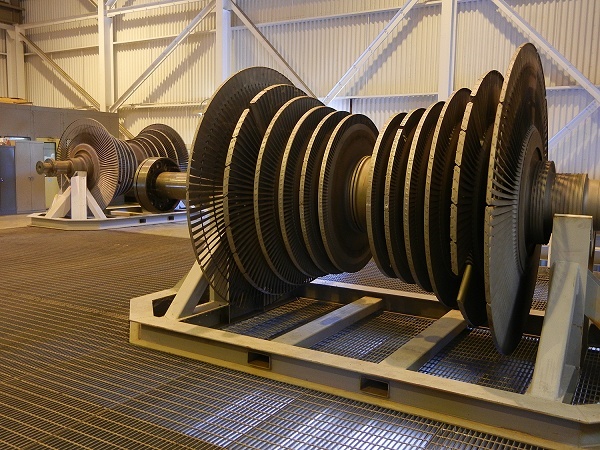 Most conventional electricity is generated by turning a turbine with a flow of hot steam. Supplying the energy to make that steam is a central issue of our time. Unlike all other energy sources -- fossil fuels, large-scale solar, nuclear, biomass -- geothermal power is unique in that the steam is already there. The steam in The Geysers geothermal field is heated to an average of 465 degrees by a geologically young body of magma high in the Earth's crust, related to the volcanic district around Clear Lake. The "fuel" of a geothermal field is water, which is heated into steam by hot rock. Pouring cold water on hot rocks tends to make them crack, opening up fractures that allow efficient steam production. But steam wells slowly decline in their output, as fractures in the deep rock fill with minerals. 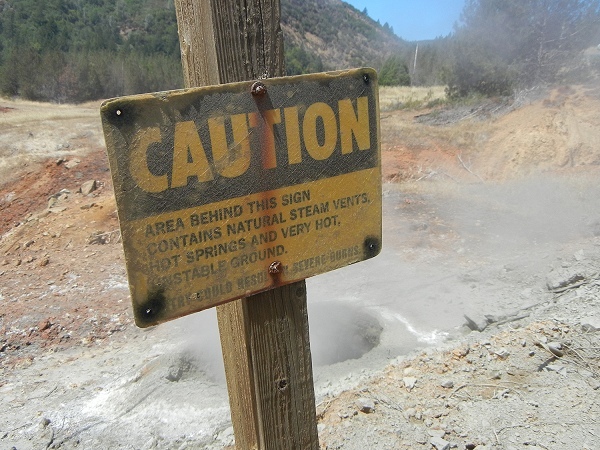 The Geysers geothermal field as a whole loses capacity by a percent or two each year. In recent years, Calpine has been exploring the northwest end of the geothermal field, where unfractured rocks as hot as 750 degrees are found. The results from its latest experiment are encouraging. Lately the state government's push for renewable green power has made geothermal electricity more desirable than ever. And the flexibility of the steam source, easy to regulate just by turning a valve, makes The Geysers valuable for helping the electric grid cope with the natural fluctuations of wind and solar power. The Geysers field is the world's largest producer of geothermal power. It puts out about the same amount of electricity as a large conventional fossil-fuel plant -- enough to power every household in San Francisco, Oakland and San Jose. Energy from The Geysers represents more than one-third of America's geothermal electricity. Put another way, it represents 18 percent of California's renewable energy, which also includes wind, solar, biomass and small hydroelectric sources. 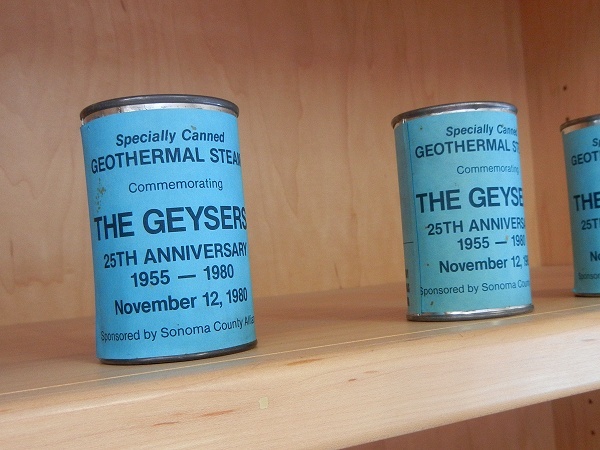 Three companies operate today in The Geysers geothermal field. Calpine is dominant with 15 power plants. Northern California Power Agency runs two plants and Bottle Rock Power has one. Recently I took part in a tour of The Geysers field led by Calpine geologists, where I heard about the company's operations and future plans. The photos in this story all come from that day. Power companies have tapped the natural underground steam at The Geysers to generate electricity since 1960. During that time, the story of the steam field has been a dialogue between society and geology. In the 1980s, high oil and gas prices, plus new tax incentives, led to as many as a dozen operators drilling wells at The Geysers, each one tapping the steam as fast as it could. The reservoir's steam supply began to run low. Two things fixed the situation. First, the field came under majority control by Calpine, allowing it to be managed instead of exploited. Second, operators found a more sustainable way to run this gigantic natural steam boiler. The Geysers field's natural water supply is limited, so operators have always recycled as much as they could, condensing the steam once it goes through the turbines and pumping it back underground. Some water is always lost to the atmosphere. Adding new water to this cycle creates what's called an "enhanced geothermal system." The new water used to replenish the steam reservoir is clean but nonpotable wastewater, piped in from the towns around Clear Lake starting in 1997, and from Santa Rosa in 2003. Today Calpine's 333 steam wells are served by 60 injection wells that feed this water down to the deep hot rock. The high-energy process of pouring cold water onto hot rocks to crack them is done regularly to refresh the wells. But it produces lots of earthquakes. Nearly all are too small to be felt, although they show up on the government earthquake map. But a handful each year reach magnitudes above 3, strong enough to cause noticeable shaking in communities next to the steam field. Calpine officials say they're tinkering with the plant's practices to minimize these, and it provides regular updates to residents. So far in 2015, the number of earthquakes of all sizes has been far below recent numbers. Indeed, just three magnitude-3 events have happened. Part of this decrease may be related to the ongoing drought, because water injection has been less than usual. But maybe it also signals an advance in managing the beast. Earthquake activity has been declining steadily for almost 25 years. Calpine's staff scientists are collaborating on several different research projects to better understand the release of seismic energy by geothermal power activity. In one of these, Lawrence Berkeley Lab studies enhanced geothermal system fields at The Geysers and elsewhere. The U.S. Geological Survey and UC Berkeley operate a network of strong-motion instruments at The Geysers in an effort to learn what distinguishes harmless earthquakes from significant ones, avoiding false alarms. While the northwest end of the field shows promise, it also presents problems. Wells drilled there in the 1990s produced steam with relatively large amounts of corrosive gases. Sulfur gases are routinely scrubbed from Geysers steam and supplied to chemical manufacturers as pure sulfur. Scrubbing chlorine gases takes an extra step, and an extra expense, between the well and the power plant. In 2010 Calpine re-entered a 1980s-vintage well to drill deeper into the hottest zone and inject water into it. Calpine's May 2015 presentation about the project to a U.S. Department of Energy meeting goes into great detail. Pumping tests went on from 2012 to 2014 and succeeded in gently cracking a sizeable body of hot rock, making its heat available to turn water into lots of steam. The experiment was a qualified success. Steam from the fresh water flushed out most of the corrosive gases, and steam production was plentiful. Earthquakes occurred, but their greater depth and greater distance from inhabited places reduces their impact. The main hitch was that chlorine gases ate a hole in the steel borehole lining. Calpine will monitor the hole until 2017, then pick a more robust alloy -- steel or titanium -- to line the pipe and proceed with the next stage of its exploration. Once safe procedures can be worked out, Calpine is prepared to move into the northwest sector. 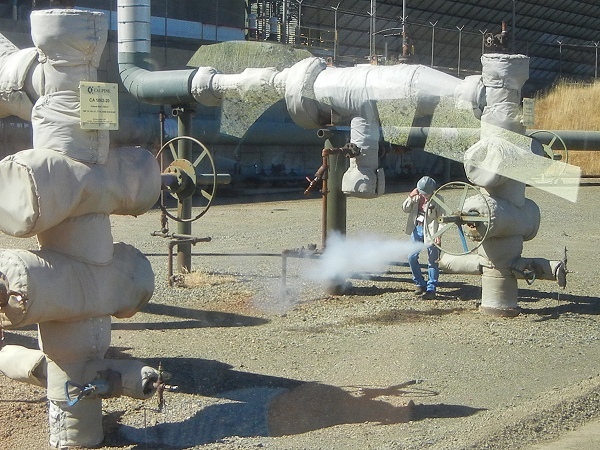 The same procedures will open up the deeper zones in the rest of the steam field, increasing the power that can be extracted and extending the life of the Geysers geothermal resource.